When will the Caterham Half Marathon and 10k take place? The Caterham Rotary Half Marathon starts at 9am on Sunday 21st July 2019. Is the Caterham Half Marathon and 10k an official race? It certainly is. Both races carry a UK Athletics licence and comply with the race standards laid down by RunBritain. Both courses will also carry a certificates of course accuracy. The race will start and finish at Redhill Aerodrome, Redhill, Surrey RH1 5YP. The half marathon race consists of two laps starting and finishing at the aerodrome. The course takes in the quiet country lanes around the aerodrome. The 10k race will be a single lap route. 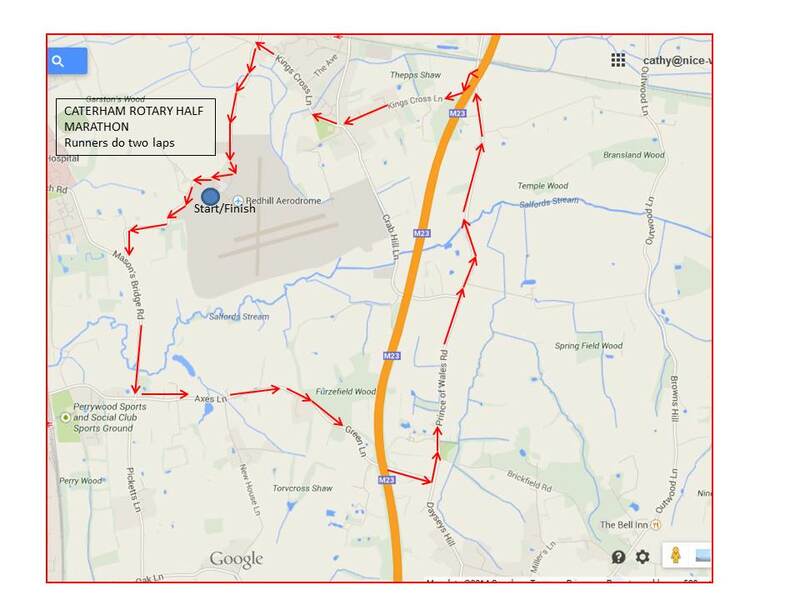 You can view a copy of the Half Marathon route here and the 10k route here. The half marathon is open to both males and females over the age of 17. The 10k is open to both males and females over the age of 15. Half marathon entry costs £22 for members of affiliated clubs and £24 for those not affiliated. There is an early bird discount for entries received before April 30th 2017. Entry on the day is £25, subject to there being places available. 10k entry costs £14 for members of affiliated clubs and £16 for those not affiliated. Entry on the day is £20, subject to availability. Please note that no refunds will be given if the race is cancelled due to circumstances beyond the control of the organisers. We strongly encourage runners to sign up in advance to ensure you secure your place. If places are still available on the day these will be allocated on a strictly first come-first served basis. Of course! All race finishers will receive a specially designed bespoke medal. Yes – just let us know when you register. When will I receive my number? Race packs and timing chips will be sent out around two to three weeks before race day. If you enter the race after July 14th 2017, race instructions will be emailed to you and your race number and timing chip must be collected from the race HQ on the day of the race. I can no longer run – can I give my place to someone else? Your entry fee is non-refundable. However, if you contact us in advance we will allow you to transfer your number to someone else. However we must have their full details no later than Friday July 1st. Failure to do so can have serious consequences and will result in the runner being disqualified from the results. There is a £3 administrative charge to cover the cost of any replacement chips requested. There is no need to sign in on the day, so long as you have your race number and timing chip. You will need to collect your pre-ordered technical running shirts on the day of the race. Yes. 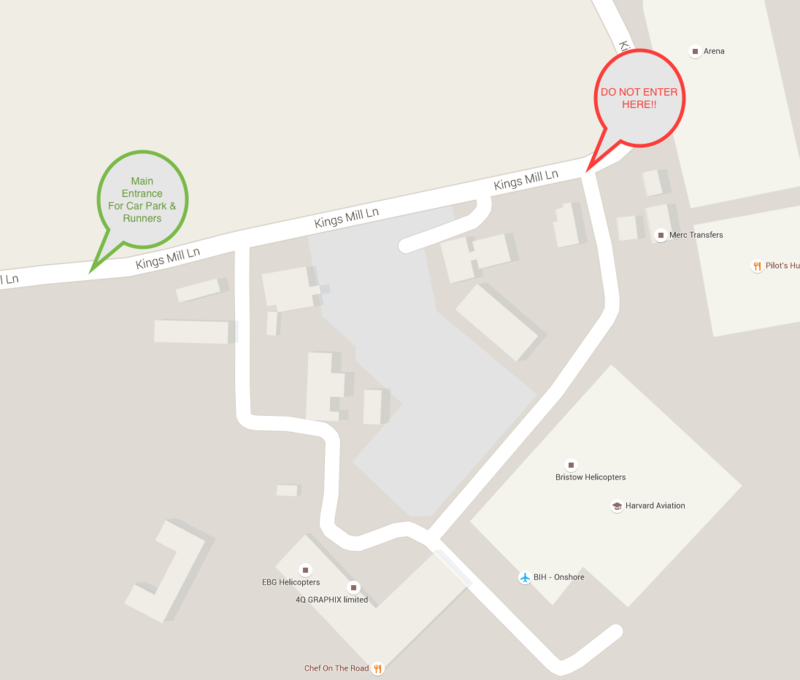 Plentiful parking will be available at the aerodrome. Access to parking will not be possible from 15 minutes before the start until 30 minutes after the start as runners will be using the entrance to get to the start. The British weather is unpredictable so just remember to dress appropriately for the race – that means layers if it’s cold and consider using sun block if the weather is particularly warm. Will there be First Aid cover at this event? Cover will be provided on the day by recognised first aid professionals. We are also proud to have the services of Raynet helping us to have course-wide radio communications. If you experience any problems in the race alert your nearest marshal. Before attempting to race we ask that you make sure that you are 100% fit to do so. If you are unsure whether or not you are fit enough to take part in a race, you can refer to the information available on the Runners Medical Resource website here. If you believe you are not fit enough to race, please think about the possible serious effects of doing so. Although there is no strict cut-off time, after 3 hours, we will begin to withdraw the race marshals from the course and you may have to finish the race unaided. We will wait for every runner at the finish and the last runner will be followed by a sweep vehicle. There will be marshals along the route. Please follow the signs and instructions given on the day. If you need to withdraw from the race at any point please notify a marshal. A sweep vehicle will be on hand to assist anyone who needs to drop out. Will there be toilets along the route? Not on the route but there will be toilets located at the start. Do I need to bring anything important on the day? Please bring with you your running number and your timing chip. Replacement chips may be available but there is a £3 administrative charge for these. You don’t need to be sponsored – your race fee will help the Rotary Club of Caterham continue their work helping to raise funds for local and international good causes. However, if you can raise additional personal sponsorship, every penny you raise counts so please raise as much as possible. Sponsorship can be sent in advance, brought on the day or handed in following the event. In the unlikely event that we need to make last minute changes or cancel te race a notice will be put on the Homepage of the website and an email will be sent to all registered runners.